China's Su Bingtian stormed to the Asian Games 100 metres title in a meet record of 9.92 seconds on Sunday, missing out on a new continental best by a whisker. The 28-year-old streaked away to win the Jakarta final ahead of Nigerian-born Qatari Tosin Ogunode -- the younger brother of Femi Ogunode, with whom Su shares the Asian mark of 9.91. 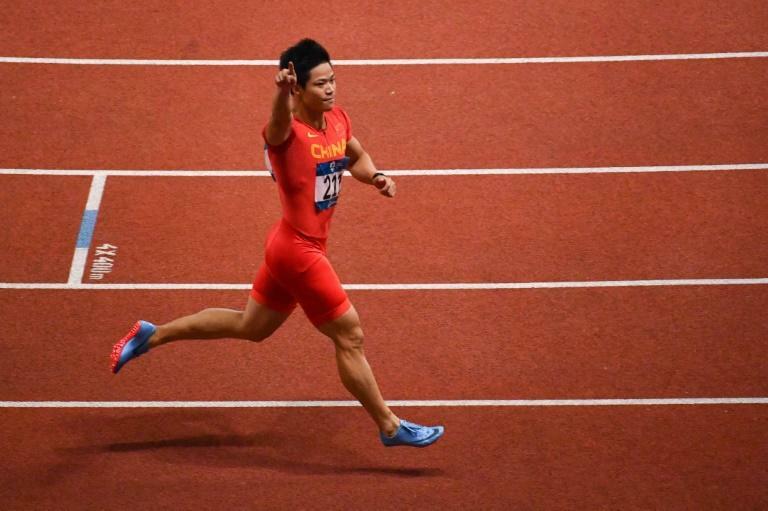 Su pumped his fists and roared in delight as he won by eight-hundredths to improve on his 2014 silver medal. Japan's Ryota Yamagata took the bronze. "All I was thinking about was winning the gold medal," Su told reporters. "The time doesn't matter. I was finding it a little hard to get up for the races and was doing just enough in the heats. But I found a little something extra when it mattered." Bahrain's Edidiong Odiong snatched the women's 100m title in 11.30 seconds after a photo finish with India's Dutee Chand, who clocked 11.32 with China's Wei Yongli taking bronze. Odiong, who originally hails from Nigeria, was one of six African-born athletes to snaffle track and field gold medals in Jakarta on Sunday. Chand's silver came after she missed the 2014 Games in a row over her elevated testosterone levels caused by hyperandrogenism, the condition that also affects South African middle distance star Caster Semenya. "I've gone through a lot of pain and anguish since the last Asian Games," said Chand. "To come here and win a silver I feel is redemption for all that I've suffered in that time." Bahrain's Salwa Naser blazed to gold in the women's 400m, silver dreadlocks billowing behind her as the Nigeria-born sprinter clocked a Games-record 50.09. Naser, who took silver at last year's world championships in London, led from wire-to-wire with India's world junior champion Hima Das runner-up seven-tenths back. Bahrain's Hassan Chani raced away to win the men's 10,000m in 28:35.54 with Abraham Cheroben, another naturalised athlete now competing for the Gulf state, runner-up in 29:00.29. China's Wang Jianan leapt to victory in the men's long jump with a new Games record of 8.24 metres, with countryman Zhang Yaoguang claiming silver with a jump of 8.15. Japan's Keisuke Ushiro retained his decathlon title with 7,878 points to pip Thailand's Suttisak Singkhon, while South Korean pin-up Jung Hye-lim won the women's 100m hurdles. Qatar's Abdalelah Hassan bagged the men's 400m title in 44.89 by some distance from India's Asian title-holder Muhammed Anas, with Bahrain's Ali Khamis third. Earlier world champion Rose Chelimo overcame brutal conditions to kick off Bahrain's four-title gold rush with a runaway win in the women's marathon. The Kenyan-born athlete ploughed a lonely furrow as she crossed the line to win in two hours, 34 minutes and 51 seconds, before complaining about the heat and poor air quality. "It was too hot," the 29-year-old told AFP. "The air here, it's hard to breathe. "I felt like I wasn't going to finish -- but I found the heart to keep going."